The stunning level of softness found in this lightweight woman's cuffed sleeve tee will nearly take your breath away. Ultrasoft is inadequate a word to describe the feeling you find when you pull this on. It's OK if you refuse to take if off. 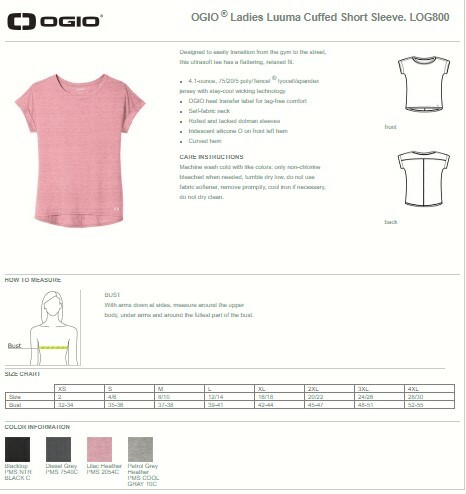 The blend is 4.1-ounces of poly/Tencel lyocell/spandex jersey that has been infused with stay-cool wicking technology. You will look as great as you feel, as this casual gem is shaped with a relaxed fit that flatters a ladie's figure. The sleeves are rolled and tacked dolman, while the hem is curved. Available in four colors, sizes range from extra-small to plus 4xl. Bulk Pricing.